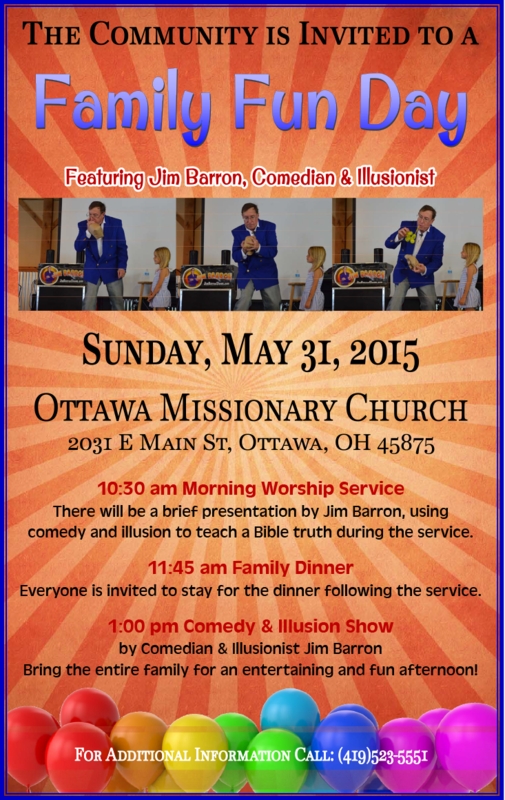 The community is invited to a Family Fun Day at Ottawa Missionary Church on Sunday, May 31st, featuring comedian, magician, & illusionist Jim Barron, heard on the WBCL Morning Show, Rise n’ Shine. 10:30 A.M. - During the morning worship service at 10:30 A.M., Jim Barron will giving a brief presentation, using comedy and illusion to teach a Bible truth. 1:00 P.M. – Christian Comedy & Illusion Show for the entire family! Jim Barron will be presenting an entertaining family program for people of all ages. Everyone is invited. Come and bring a friend! ← Good Friday Service, March 25 at 1:00 P.M. "Jesus, The Lamb of god"